Johnston County, N.C. – January 7, 2019. 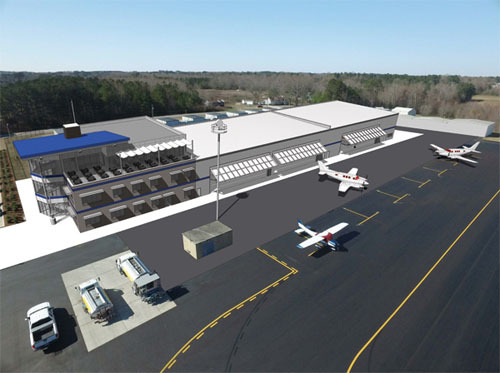 The Johnston County Airport Authority Board announced a partnership with Blue Line Aviation LLC for the development of the Blue Line Aviation Complex at Johnston Regional Airport (JNX). This $13 million project will include a state-of-the-art hangar and premier flight school for both private and commercial aviation. “Johnston Regional Airport is a significant economic development asset in the heart of Johnston County and the greater Triangle region. Blue Line Aviation’s decision to choose our airport for their aviation complex is a reinforcement of the economic asset this airport is for Johnston County,” said Ken Starling, chairman of the Johnston County Airport Authority. “We are very pleased to have Blue Line Aviation partner with us as we work to develop and expand the potential at JNX the premier location for economic development, business travel and now aviation training. “We are very excited to partner with Mr. Trey Walters and the team at Blue Line Aviation LLC. With strong local support in Johnston County for business growth, and aeronautical facilities that are second to none, JNX is the perfect location for Blue Line to build their new Aviation Complex. The public private/partnership announced here today between Blue Line and the Johnston Regional Airport (JNX) represents an extremely effective capital development model that we can all get behind and support. I hope this is the first announcement of many more to come!” said Phil Lanier, airport director of the Johnston Regional Airport. “JNX is an asset for people and companies across Johnston County and the Research Triangle,” says Chris Johnson, director of Johnston County Economic Development. 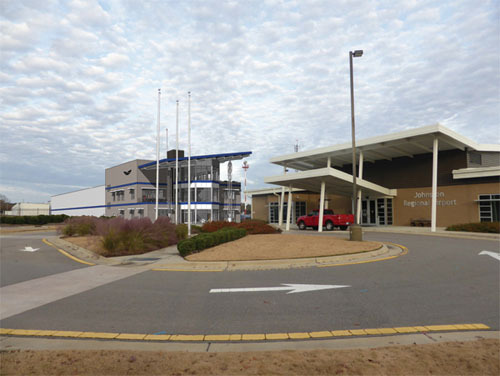 The airport’s location off US Highway 70 west of Smithfield makes it a convenient base of operations for regional airport tenants such as Sparkchasers Aircraft Services and Duke Life Flight. “The Johnston Regional Airport is within easy reach of top employers like OPW, Grifols, Novo Nordisk, Caterpillar – all of which are growing global businesses, making JNX a key piece of economic development infrastructure for our county.” In addition to its direct job-creation impact, the Blue Line Aviation Complex enhances the airport’s value as a transportation asset, according to Johnson. For more on Johnston County Airport and Blue Line Aviation LLC, please visit http://www.johnstonnc.com/jnx and http://www.learntoflyjnx.com.